You’re invited to bring your solar eclipse viewing glasses* and gather on the East Terrace Lawn at 1:10 p.m. TODAY to view the partial solar eclipse that will pass over Evansville. Get a FREE Solar Pop while supplies last. DON’T FORGET TO BRING YOUR SOLAR ECLIPSE VIEWING GLASSES! Evansville will not see totality from this location, however, we are close to the direct path and should experience 75-80 percent coverage when the moon passes in front of the sun between 1:20 and 1: 30 p.m. Therefore, it is extremely important that you use appropriate protective eyewear. If you do not already have glasses specially designed for viewing the eclipse, please find a pair to bring with you to this gathering. * Per the American Astronomical Society Solar (AAS), eclipse viewing glasses are designed exclusively for looking directly at the everyday sun. These glasses reduce sunlight to safe levels so that you don't injure your eyes…and they meet the ISO 12312-2 (sometimes written as ISO 12312-2:2015) international safety standard. Note that special-purpose solar filters are many thousands of times darker than ordinary sunglasses! However, not all marketed solar eclipse viewing glasses are ISO certified as unscrupulous vendors will market glasses as ISO certified when they are not. 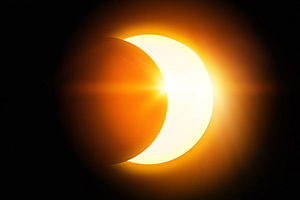 Thus, refer to AAS’s list for approved vendors https://eclipse.aas.org/resources/solar-filters.